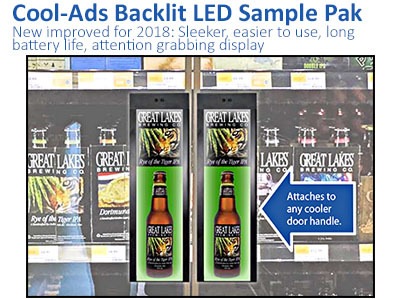 Backlit LED Handle Sample Pak! Our sample pack enables you to compare the (2) materials our handles are constructed of, and the (6) different clips allows you to be able to field test any existing cooler handle for best match. Our “J” clip is the standard covering 80% of the USA market. The "Z" & "ZC" are specific to Full Length Door Handles, and the "C", "SQ" and "F" cover the balance of the marketplace. 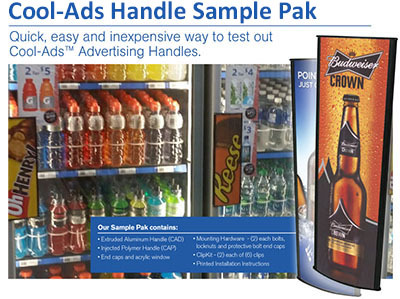 Get a Handle on Your Advertising! Our sample pack includes: 1 CADIGK unit complete, 12 AA Alkaline Batteries, and a sample Reverse UV printed sample ad. Give us a try! We make it easy with our Sample Pak.